Leftover Threads was born out of the frustration with the unethically mass produced and disposable, combined with the desire to create original and unique pieces that are sustainable and stylish. Swedish born Sibel Lagerdahl had a passion for craft from a very young age. She used to get into trouble for cutting up her clothes. But later on when her mum introduced her to the sewing machine, she started to put the pieces together. In her university years she started to get commissions from around the campus. As she was studying philosophy, she enjoyed having this creative sideline. In 2001 she ditched the thick and dusty library books and moved to Brighton to get hands-on! Since then Leftover Threads has developed into what it is today; a conscious and creative label offering style to those who care. Leftover Threads works in collaboration with Magpie Recycling Cooperative where most the materials are sourced from. 99% of all the materials we use are recycled. 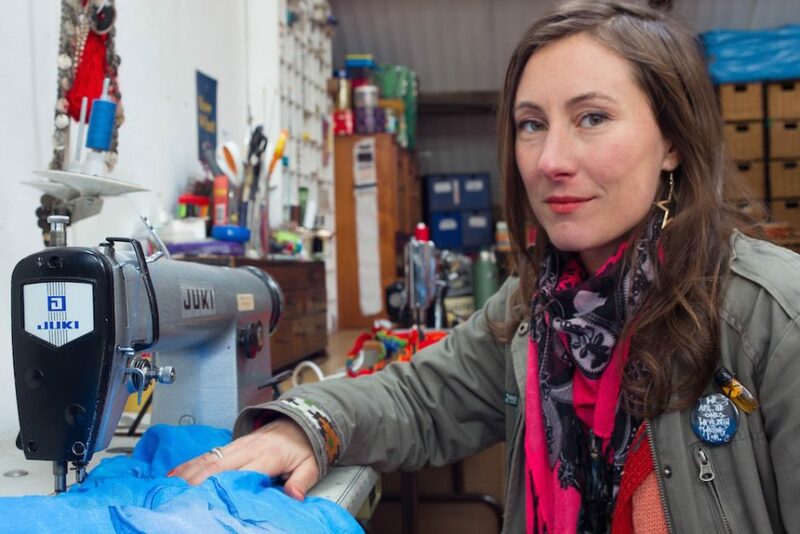 The textiles are salvaged from Shabitat- Magpie Recycling in Brighton. This is where we hand-pick fabrics we think still got plenty of life left in. The great thing about using secondhand textiles is that they have already been washed several times, so when something new is made from them, they won’t twist, misshape or shade. What you see is what you get! So why use new textiles? There is so much good quality fabric in existence already. Instead of buying garments that we only wear for one season, invest in some quality, timeless pieces. Update your look with accessories to create a statement. Don’t get rid of clothes just because it has a hole in it. Fix it, mend it, or even better, be creative and customise it! Come along to one of our customising workshops! Or let us do it for you! Check out our Restyling Service. Bored of your old clothes? Find or organise a clothes swap. The most polluting part of your garments’ life is the washing. Try to get more wear out of them between each wash. Do the sniff test! Wash your woollies and delicates by hand, they will last longer, and its energy saving. A 30° or 40° wash is all you need. Use ecological washing products, dry naturally and iron only if you have to. The textiles we use are already in existence, so we don’t put pressure on new resources. Made from locally sourced materials. The only bit of travel the item will do is from us to you! We use 100% renewable energy, and are carbon neutral. No sweatshop, no middleman, just fair wages directly to the maker. Recycling and reusing textiles reduces the need for landfill space and incineration and meaning less methane and less carbon dioxide. You will look unique and stylish with a clear conscience. Creating a garment from recycled materials uses less than 3% of the energy that it does to make it from raw materials. Over 1m tons end up in landfill or incinerated, and only a quarter of it gets recycled.